What is Cardamom | Facts and Info on the Enigmatic Queen of Spices! I often get asked what is cardamom? Only questions about how to use saffron and vanilla for cooking are more common. And if you're into replicating authentic flavours from cuisines around the world, this is one ingredient you need in your spice rack. People have been making use of this enigmatic ingredient in their cooking, medicine and ceremonies for thousands of years. 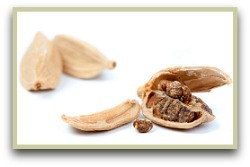 Read more on the history of cardamom. Somewhat surprisingly it's a member of the ginger family, and the three main types commonly found in shops and used in your cooking are green, white and black. You'll find the plants growing wild in the hills of southern India, where even today the delicate pods are back breakingly hand-picked and sorted by hand; the same way it's been harvested for millennia. Today it's Guatemala that takes the crown as the biggest producer and this spice has even overtaken coffee as the country's main crop! This is the type you want to use in your ice cream, desserts, rice dishes, Turkish coffee and masala chai. Read more on this variety. ...is found growing in Pakistan and India. The dark brown pods are larger than the green ones and are much more potent, so use these sparingly as a little goes a long way! In each pod - black and green - you'll find about 20 - 40 tiny black seeds and it's these that will enliven your cooking. Crush the pods, add to your recipe and the seeds will dissolve in your cooking, leaving the husks which you can remove. Click for more info. This stronger flavour makes them perfect for your more robust curries and heavier Asian recipes. It's also essential in some of the more strongly flavoured mixes and blends. ...are the type favoured in Scandinavia, and are used in a traditional glogg recipe, a mulled wine drunk around Christmas time. Note: The white pods are really just green bleached with sulfur dioxide. This bleaching dulls the colour and flavour somewhat! I prefer lots of flavour in my pods, so I don't often use these. I prefer to use the unprocessed green pods and seeds for my lighter dishes. If making your own spice mixes is your thing, the ground seeds are essential for garam masala recipes and the Ethiopian blend berbere amongst others. ...So I don't recommend buying the powder, rather get out your grinder or pestle and mortar and grind the seeds yourself. The little bit of extra effort is more than worth it. 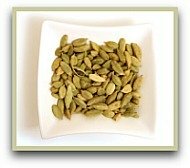 You can also make a potent cardamom tea with the green pods and seeds which has a host of health benefits. Click for my tea recipe.